The holidays are nearly upon us which means equal parts excitement, stress, and opportunity for both retailers and shoppers alike. And for good reason. According to Deloitte, holiday retail sales could top $1.1 trillion this year, a 5% increase from 2017. So how can large and small retailers compete in the very crowded space that is holiday shopping? How about bridging the gap between physical and digital product experiences? With the recent release of Apple’s AR Quick Look and advances in open-source WebXR, the magic of high-fidelity augmented reality is now possible not only in-app, but also on the web. Thanks to platforms like Shopify and our very own Axis, it’s easier than ever for retailers to implement 3D and AR directly on their online product pages. So now that AR for retail is easy, let’s talk about why it’s important. We’ve already established that 3D and AR increase consumer confidence and conversion. Interior design platform, Houzz, reported consumers exposed to AR products were 11 times more likely to purchase and spent 2.7 times more time in the Houzz app. But how does that tie into your holiday marketing strategy? To keep it simple, we’ve made a list of the top 5 ways retailers can use 3D and AR to significantly increase conversion while creating a better holiday buying experience for their shoppers. The way in which we consume content is shifting, with the amount of time spent watching live television on the decline while time spent on mobile devices continues to increase. In 2017, Salesforce released a report that over 40% of all sales made on their global e-commerce platform in November and December happened on mobile phones. Mobile now accounts for more than 50% of online sales, particularly in-app, in most regions. But you don’t have to have an app to be competitive here. 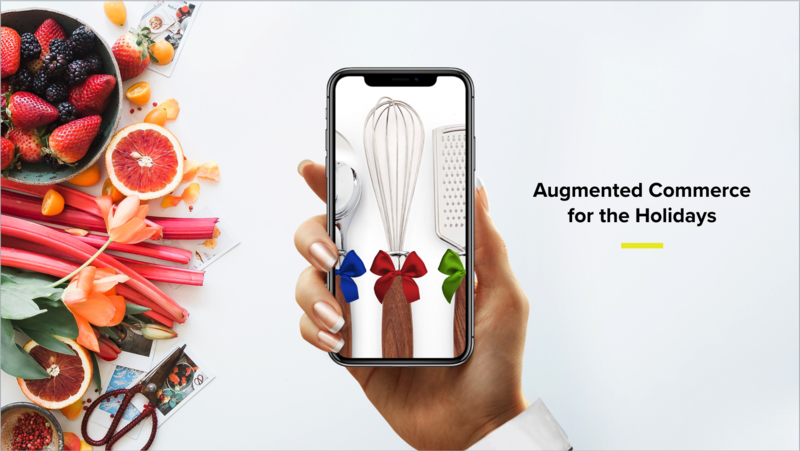 Web-based 3D and AR experiences are available both as on-page product listings via augmented commerce, as well as paid media both on desktop and on mobile web – no app needed. This means mobile web users can now explore 3D objects and tap to AR to experience those products in their world. According to Criteo, 62% of shoppers use their phones while they’re in-store. This means that even when consumers are shopping in person, they’re available on mobile. Top retailers are already deploying strategies that improve the consumer buying journey at every stage and location. With 3D and AR on the web and in-app, you can send 3D products home with consumers to help them better gauge value, fit, and ultimately, what ownership looks like. Enabling shoppers to virtually “try before you buy” is essentially enabling part-time experiential ownership. A consumer can shop for the perfect piece of furniture in-store or online, but try it out at home in AR before committing to a major purchase. Connect the dots between in-store, online, in-app, and social with high-fidelity 3D product models that are deliverable everywhere on every device and in every channel. Shoppers are looking for not only products, but experiences - especially when it comes to gifts. This is why branding and messaging are such significant parts of a marketing strategy. You’re not selling a camera, you’re selling a brand, a style, an opinion. 3D and AR open the door to show shoppers firsthand what that looks like. The experience becomes even more important when shopping for the perfect gift. Experiences create excitement, a feeling people want associated with the gifts they are buying for loved ones. If I am excited by a product, surely that excitement will translate to my loved one. Furthermore, I can convey just how well I know the people I’m shopping for by choosing gifts that reflect their lifestyle choices because I have “experienced” the product myself. Even though we eventually tire of them and find new ones, our belongings often play a large part in defining us. They make up our public persona and establish who we are long before someone gets to know us. For that reason, products are owned and cherished and needed. When we need something, finding the right one can be an uphill battle, especially if that particular item is relatively expensive. Whether in-store or online, shoppers want to contextualize a product before committing to a purchase, and interactivity with that product provides context. What does the item look like from every angle? Are there buttons or knobs or dials? Will it fit in my space? Are there two USB ports? What about an HDMI cable? Is it the same size as my monitor now? What size is my monitor? Answers to all of these questions and more are possible with 3D and AR. According to Hubspot, returning shoppers are 9x more likely to purchase than a new shopper. While returning customers typically only represent 8% of business, they represent 41% of revenue (ding, ding, ding). Retention marketing, which focuses on returning customers, involves creating a personalized shopping experience long after the initial purchase has been made. 3D and AR are incredible tools for creating personalized experiences. By implementing 3D into the product page, retailers can leverage interaction-based data to better understand how shoppers are reacting to their physical products. This data can be applied to past customers to curate personalized follow-up with insights specific to their 3D and AR product experiences. There you have it - 5 strategies for ensuring retail success during the holidays. Looking for more about 3D & AR commerce? Stay tuned, it’s our business, after all. Ready for a deep dive? Check out our complete guide to Immersive Commerce and what makes 3D & AR so compelling.